The unlocked iPhone 5 is now for sale on Apple’s Web store. 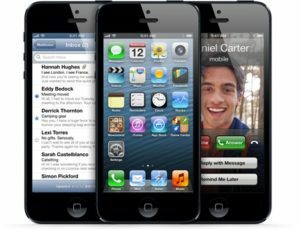 It’s official — unlocked iPhone 5 smartphones are now on sale in the U.S.
As of today, instead of choosing from carriers Sprint, AT&T, and Verizon when buying the device at the online Apple Store, the tech giant is also offering the option of an “unlocked and contract-free”iPhone 5. By selling the smartphone unlocked, it means that users can insert nano-SIM cards from any supported carrier for use on the network, as opposed to the locked phones, which are tied to the carrier they purchased the phone from. However, the feature comes at a cost: unlocked buyers pick up the full price of the iPhone, which starts at $649 for the 16GB model (compared with the subsidized $199 entry price on contract), $749 for the 32GB model, and $849 for the 64GB model (see below). The iPhone 5 launched in September with 4G LTE, free turn-by-turn navigation, and a faster A6 processor. It also included a top-to-bottom redesign that made its screen longer and thinner, and the entire device lighter. News leaked earlier today that the unlocked smartphone would be for sale online tonight and people would also be able to pick them up at retail stores in the near future. The unlocked models are slated to work with both AT&T and T-Mobile nano-SIM cards in the U.S.
Other news today said that the supply of the iPhone 5 is easing, with new orders from Apple’s online site shipping in one week, down from the nearly month-long delay shortly after the product’s launch. This holds true for the unlocked iPhone 5 too, which is available to ship within one week, according to Apple’s Web store.